Morning all! Via the fabulousness that is My Treasury of Chaplets, I am able to explore making special chaplets as gifts, and being the bead fan that I am, I am always on the prowl for an excuse to buy and mold more into wonderful prayer configurations. As I was flipping through the book a few months ago, I saw that it had an Appendix. Huh. Never noticed that before. The entries usually all have full descriptions and photos of each chaplet, making it easy to create them on your own. The Appendix lacked pictures, but the descriptions were still sufficient. A chaplet to St. Dominic Savio was listed in there. Score. Henry *loves* St. Dominic Savio. Since St. Dominic is a child saint, Henry really relates to his story, and I think that it's an excellent example for young boys. I thought that if I made him this chaplet, we could pray it together at night before he went to bed. It was tougher with no photograph, but I managed and some image searches online seem to indicate that I did it correctly. 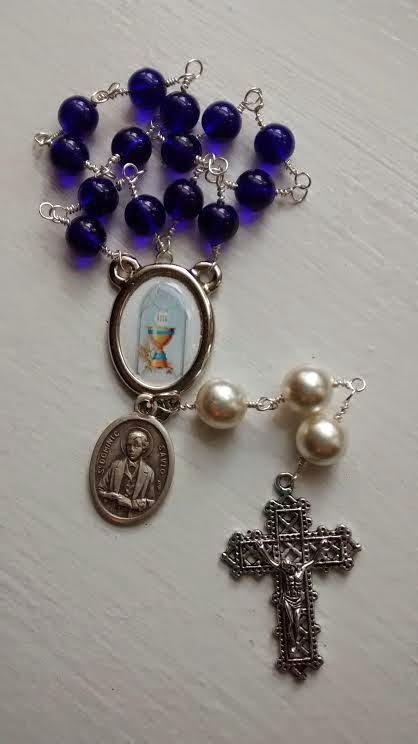 For this chaplet, what we have is a crucifix and center, 3 white beads and 14 blue beads. The white beads represent the Trinity, while the blue beads represent the 14 years of St. Dominic's life and his devotion to Our Lady. First Bead: Faith. Pray a Hail Mary. Second Bead: Hope. Pray a Hail Mary. Third Bead: Charity. Pray a Hail Mary. You will now move into a series of 3 invocations that begin and end at the centerpiece. You pray the invocation at the center, then move around to each of the 14 blue beads, reciting St. Dominic's personal motto on each: "Death before sin." (a little heavy for young children, but I think with a good explanation all will be well. :)) Repeat for each invocation. First Invocation: St. Dominic, you know how hard it is to fight temptation in this life. Consider me as your friend in need. Obtain for me the grace of purity in thought, word, and deed. Help me to improve my self control. Second Invocation: St. Dominic, you loved Our Lady and went to her with your needs. Go to her and ask the grace to help me remember to ask for her help especially when I am most sorely tempted. Obtain for me an increase in love for her, our most tender and loving Mother. Third Invocation: St. Dominic, you prayed for your family and friends. Please go to Our Lady and intercede for my family and friends, and also for my personal intentions. Concluding Prayer: Thank you, St. Dominic, for your intercessions on my behalf. Please pray for me every day of my life. St. Dominic, you struggled in this life with the same temptations to sin as I have, but you never gave up trying. Obtain for me great confidence in Our Lady and the grace of final perseverance, that some day in heaven we may enjoy the delights of her company and sing the praises of the Most Holy Trinity. Through the intercession of Our Lady Mediatrix of all Graces. Amen. For Henry's chaplet, I chose a First Communion centerpiece, since that is appropriate for his current state in life, plus St. Dominic Savio was devoted to the Eucharist. And for whatever reason, centerpieces with the majority of saint images on them are very rare and hard to find. St. Joseph? You're golden. St. Anthony, St. Francis, also no problem. But St. Cecelia? Not so much. St. Kateri, for whatever reason, a snap. St. Maximillian Kolbe or St. Dominic Savio? Move along, sister! Unless you want to pay nearly $40 for a sterling silver variety, impossible to come by. Saint *medals* abound, but the rosary centerpieces are much more limited. So I procured one with the First Communion image and affixed a St. Dominic Savio medal, voila! I used large white pearls from a necklace of mine that had broken, and cobalt blue beads for the main section. I love how it turned out and can't wait to tuck it into Henry's Christmas stocking. Any other St. Dominic Savio devotees out there? :) Leave me a comment! It looks fantastic. Just so you know, I just bought that book because of you! You're encouraging my crafting habit!